The digital revolution is rapidly evolving and new technologies such as apps and wearable devices are emerging at a fast pace. These standards help developers and investors understand what evidence is required to introduce their product for use in the NHS. Working collaboratively NHS England, NICE, NHS Digital, MedCity, Public Health England and DigitalHealth.London have engaged with industry, commissioners and innovators to understand what is required for health technology to thrive in the UK. The resulting standards support digital health technology development and provide guidance on what evidence is required when innovators present their products to NHS commissioners. Digital technology increasingly plays a key part in everyday life and they are now using these tools to help diagnose, treat and monitor their health. This will radically change the way care is planned, provided and received. It is vital, therefore, to make sure that the appropriate standards and guidance are in place to ensure digital innovators are given the support they need. The new standards address both clinical and economic impact and as well as identifying the evidence needed to develop a case for use in the NHS. The standards also equip NHS commissioners with details of what tp ask for from technology developers and understand what to expect in return. This will enable the health and care system to identify which products show promise, which need further development and remove those that are unsuitable. Download the full Evidence standards framework for digital health technologies and associated guidance. NICE are interested in hearing your views on the evidence standards framework. They are running a feedback survey on the standards until Monday 7 January 2019. Tell NICE what you think in their short survey. 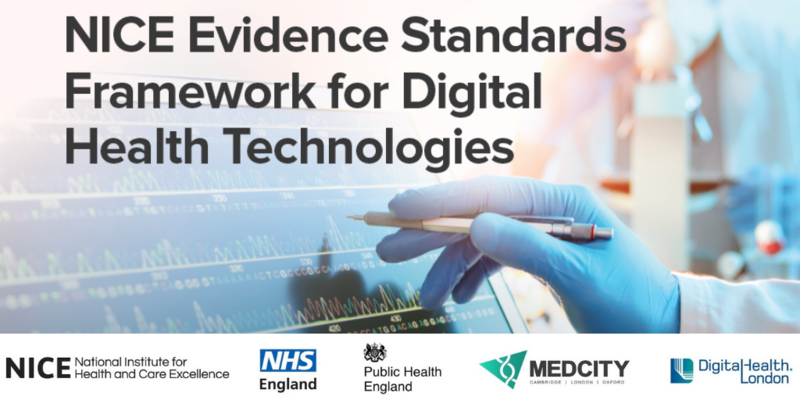 The Digital Health Evidence project, led by NHS England, NICE, Public Health England, MedCity and DigitalHealth.London, aims to develop digital evidence standards to address and streamline support on this issue.